Editor’s note: Every international student from China has their unique journey. Often the best way to welcome them is to learn about their own personal story. This post is an interview of a former student, Wen. She reflected on her own experiences as an international student, and sharing some of her observations of today’s Chinese students. What was your experience as a new international student? When I first came to the United States in 2011 to pursue my master degree, there were a few things that surprised me. I was amazed that the sky was so blue and people were extremely friendly. Yet coming to a small Southern Texas town, I was challenged by the hot weather in the summer and how much I had to walk in the heat! Plus I found my English insufficient for both academic and relational purposes despite the 10 years of English language education I had before I came! Sometimes I found the menu in a restaurant even more difficult to understand than my professor’s class notes. I often felt like an elementary school kid who had a lot of physical needs (furniture, car rides, English vocabulary…) as well as emotional needs (loneliness, homesickness, and cultural shock…). What are some of your observations of today’s Chinese students? People say that today’s Chinese students are different. There are a few things I have noticed that have changed since my college days. One is that the Chinese students who come to the US are younger and more self-sufficient. Today, you can find many Chinese high schoolers and undergraduate students in United States. Many are from higher income families, and they can get a nice car for themselves in a very short time without any help from the Americans. The church I used to go to has an annual furniture give-away to help new international students. I remember standing in line the night before the give-away in order to get a large piece of furniture like a couch or desk set for free. But in recent years I heard that they started to have leftovers in stock because students can get furniture on their own. Another difference I noticed is that today’s Chinese students are more connected with each other through the use of social media. 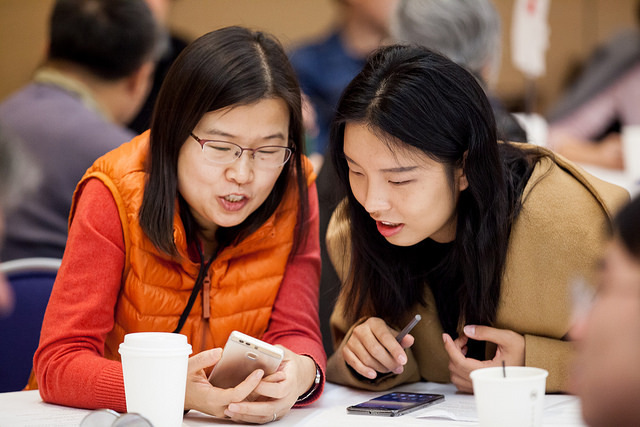 Even before they arrive, many of them are already part of a WeChat group of new incoming Chinese students of their universities. I heard many of them successfully find an apartment, roommates, and even connect with senior students in their department through WeChat groups before they have even purchased an airline ticket. As a result, they adjust to life overseas more quickly and are less likely to feel lonely in the first couple of months. Comparing to your days, it sounds like they have everything they need. What struggles do you think they might have today? They do still have struggles. Homesickness is still real to many of them. I have heard from many young Chinese students how they miss the food from their hometown as well as their friends and families back in China. Without the familiar support they had, building or finding a new community here can still be challenging. Because they come to the US at such a young age, many of them have little experiences living with others and developing cross-cultural friendships. Learning how to deal with cultural differences and conflict is another challenge. I have seen some initially well-connected students become lone rangers after experiencing conflicts with their roommate or classmates. Instead of continuing to pursue genuine friendships, they would rather take care of their own business because it seems easier to be alone. As a result of that, I usually find students spend a lot of time on their phones or computers creating their ideal life through social media or games. Even when they are in a small group setting like a Bible study or just a casual hang out, they might be frequently looking at their phone, swiping or typing on their phone. I believe they long to talk to people who they can trust, but they will need to first learn to be patient in developing friendship in a new environment. Do they have deeper struggles? I think the answer is a definite “yes”! We were created as relational beings. What are some ways for us to come alongside them? While airport pick-ups, rides to school, the grocery store, or furniture store might still be helpful, it may not be the best way to serve today’s Chinese students because they can meet those needs more easily today. I think the best way for us to serve them is through caring for them and loving them. There are some small steps we can take. For example, we can befriend them on social media (WeChat, Facebook, Instagram) and follow what they post. Their posts often reflect what their interests are. When you meet them in person, you can always ask them about their post as a natural way to get to know them. Since they spend a lot of time online, you can connect with them simply by sending them a message on social media whenever you think about them. A simple “how are you?” or “I’m praying for your!” can mean a lot to them. As you get to know them, they might open up and share with you something personal, like family issue or their conflicts with professors or lab mates. Make sure you ask specifically about their feelings toward it, because Chinese students tend to hide their feelings and are not good at describing their feelings verbally. They’re more used to using the internet and its language to ridicule their serious thoughts/feelings. Lastly, give them opportunities to serve you or others. They enjoy serving in a project like planning a party, decorating the rooms, or cooking food. And don’t forget to take selfies/photos with them at every occasion! Can you share a recent interaction with today’s Chinese student? Cindy is a post-90s Chinese student from a rich family in a big city. She’s a thinker and doesn’t enjoy talking to people much. Whenever I see her, she always dresses very nicely. The brands she uses on her face and body are too luxurious for me to buy! We met at a very random gathering and I didn’t even get a chance to talk to her, but she agreed to have coffee with me when I initiated. At first she was very quiet and I had to carry the conversation all the time. Later on, as I started opening up to share my thoughts on my family, she started sharing that her parents are divorced and she has been struggling with trusting people. Since that conversation, we have become closer friends. I’ve had many opportunities to share wisdom from the Bible in handling relationships and managing emotions. We don’t always get together to talk, sometimes she’ll just initiate with me on social media, other times she will share with me a funny post about cats. And sometimes it is a serious post about what’s in the news, and even an article about faith and God. When she went back to China, she asked me to pray for her as she interacted with her step-dad. I introduced her to many of my friends in my small groups and in my church. Although she’s still not used to being in a big group setting, she enjoys meeting people in life who seem reliable and trustworthy, and she has become a more optimistic person. Some of us probably have been welcoming Chinese students for years. Do you notice the difference between the students you welcomed five years ago and the students today? What are some ways we can adapt to welcome and love on today’s Chinese students?